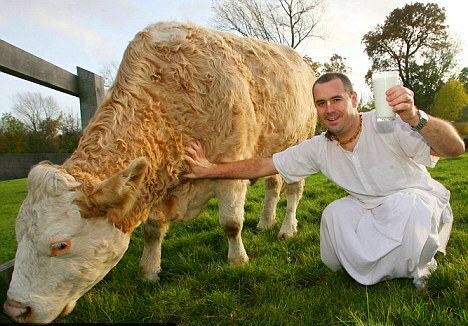 “Milked only by hand to the sound of sacred mantras, these garland-wearing cows could be the most pampered in the UK. But they are producing the most expensive milk in the land, costing £1.70 per pint – nearly four times more than usual. The animals are being reared on a farm run by Hare Krishnas meaning, as per Hindu rules, that none must come to any harm.